Despite being successful playing away games, the Sharks are struggling to win at home. The San Jose Sharks are trying to defy history. The Sharks take a team-record seven-game road winning streak with them as they head to the Midwest for games in St. Louis Friday and Nashville Saturday. Their 13-3-2 mark away from San Jose is the NHL’s best. But if they don’t start winning at home, history says they’ll have trouble making the playoffs, let alone winning the Stanley Cup. 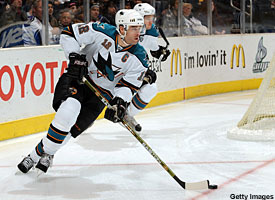 The Sharks finished the pre-Christmas portion of their schedule with a thud, losing 5-2 at home to Anaheim. That dropped their record at HP Pavilion to 6-9-3 and made them one of only five clubs in the NHL averaging less than a point per game at home. No team has made the playoffs with less than a point a game at home since the Edmonton Oilers finished eighth in the Western Conference in 1998-99 with a 17-19-5 record. The only team since then to make the playoffs with a home winning percentage as low as .500 was the 2002-03 New York Islanders, who went 18-18 with five ties at the Nassau Coliseum while finishing eighth. Making the playoffs with a sub-.500 record at home may be difficult, but history says winning a Stanley Cup would be downright impossible. Since the NHL added four teams from the WHA in 1979, no Cup winner in a full 80-plus game season has finished less than eight games over .500 at home — Detroit was 20-12-9 in 1997-98 and Pittsburgh finished 21-13-6 in 1990-91. The Sharks have a lot of catching up to do just to get that far. They’ve already lost more home games in regulation than each of the past two Cup winners — Anaheim was 26-6-2-7 last season and Carolina went 31-8-2-0 in 2005-06 — and no team since the WHA expansion in 1979 has lost more than 13 home games and gone on to win the Cup. Reflections on a memorable night — Christmas came five days early for Minnesota’s Marian Gaborik, who became the 42nd player in NHL history to score five or more goals in a game when he got five in a 6-3 win over the New York Rangers on Dec. 20. Gaborik’s big night was the first five-goal game of the 21st Century and the first in nearly 11 years, since Detroit’s Sergei Fedorov had five in a 5-4 overtime win over Washington on Dec. 26, 1996. It was the second-biggest gap ever in five-goal games, and the longest since the installation of the red line. The longest gap was 11 years and 17 days, from Jan. 19, 1932, when Charlie Conacher had five in Toronto’s 11-3 win over the New York Americans, to Feb. 6, 1943, when Montreal’s Ray Getliffe scored five times in the Canadiens’ 8-3 win over Boston. * The Rangers are no strangers to surrendering five-goal games. Gaborik’s was the sixth against the Rangers since they entered the NHL in 1926, the most allowed by any team in that span. Philadelphia, which entered the NHL in 1967, is next with five. * Since the beginning of the modern era, in 1926-27, Montreal leads all teams with seven five-goal games, followed by Edmonton with six — four by Wayne Gretzky, the all-time individual leader. * Alexei Zhamnov, who had five goals in Los Angeles on April 1, 1995, has two distinctions: He’s the last player to get five in a road game — and the only player to score five goals in a game his team didn’t win. The Winnipeg center had his five-goal night in a 7-7 tie against the Kings. No one ever has scored five goals in a loss. * Red Berenson, who had six goals for St. Louis at Philadelphia on Nov. 7, 1968, is the only player to get five or more in a shutout. Berenson’s big night came in an 8-0 victory over the Flyers. * Gaborik was the first member of the Wild to get five goals in a game, but he’s the second Minnesota player to do so: Tim Young of the Minnesota North Stars (now the Dallas Stars) got five on Jan. 15, 1979 — also against the Rangers. Home cooking — For nearly three decades, the arrival of Christmas has meant that the Philadelphia Flyers would be heading right out on a long road trip. But not this year: The Flyers beat the Toronto Maple Leafs 4-1 on Thursday night in their latest December home game since they beat the New York Rangers 6-5 on Dec. 28, 1978. Not that the Flyers won’t be heading out of town soon: Philadelphia begins a six-game trip Saturday night at Tampa Bay, and won’t be home again until Jan. 12. Happy New Year! — Perhaps lost in all the attention being given to the Winter Classic is the fact that three other games also are scheduled on New Year’s Day. No one will be happier to be on the ice at home for New Year’s than the Maple Leafs, who host the Tampa Bay Lightning that evening. Since 1926, when they beat Ottawa 3-0, the Leafs are 15-4-2 in home games on New Year’s Day, including a 5-1 victory over Boston to begin 2007. Since the first expansion in 1967, they are 7-1-1 at home on Jan. 1. Dreaded day — The NHL hasn’t played on Christmas Eve or Christmas Day in well over 30 years. The Montreal Canadiens would probably like to have that break extended to Dec. 23. Sunday’s 4-1 loss in Dallas marked the Canadiens’ sixth straight loss in games played on the eve of Christmas Eve, and they’re 0-9-1 overall on Dec. 23 since beating Pittsburgh 1-0 at the Forum on Dec. 23, 1995. Road games on Dec. 23 have been particularly nettlesome: The Canadiens haven’t won away from Montreal on Dec. 23 since a 4-1 victory in Boston in 1945. They’ve lost 10 times and tied eight since then, including losses in each of the last five seasons.